Entrepreneurship can be a lonely path. It’s important to build your social circle to be sure that you have a core group to check in with and look to for advice along the way. 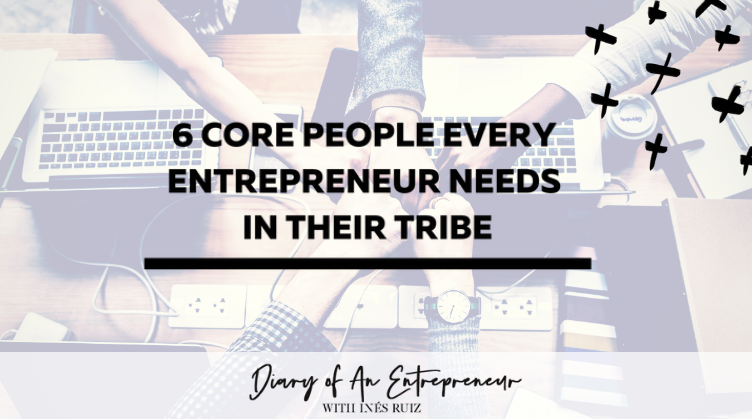 Do you have the following six people in your tribe? This is the person you know you can go to with all of your big ideas and be met with support and encouragement. It might be your significant other or your best friend. Who was the first person you told when you made the decision to branch out on your own and become an entrepreneur? There’s a good chance that’s your trusted confidant. There’s a lot you can learn from someone who has been in your shoes before. The mentor can be anyone that you look up to professionally. It might be a peer who’s also an entrepreneur that you admire or it could be someone a little older with a little more experience. This person can offer guidance as you make big and small decisions and can give you lessons based on their own missteps and successes. We all need someone to get us out of our comfort zone, and the risk taker is that person in your tribe. The risk taker will always be there to hear you out while you talk about big plans, then respond by telling you to go for it. Sure, this could cause some problems, but it could also lead you to make incredible power moves for your business. Who do you go to when it’s time to dream the big dreams? Your trusted confidant may be the one you go to when you’re ready to share your big news, but the dreamer is the person you’ll spend hours with, talking about where you see yourself in the future. Time with this person isn’t spent going over budgets and working through roadblocks. It’s spent picturing yourself as a business mogul, author of a best seller, media maven, and all around superstar. While the dreamer will give you space to explore wild ideas and over-the-top goals, the realist will bring you back down to earth. Everyone needs that sometimes. It’s not that this person wants to rain on your parade, but they’ll be the one most likely to point out potential obstacles and encourage you to really think through the logistics of a plan before running at it full speed. There’s one in every tribe. The social butterfly is the person who can walk into any room and immediately make a new friend. In a social group, this person is fun to go to parties with and will spur you to talk to the person you’ve had your eye on. In your professional life, the social butterfly can be a great sidekick at networking events and will help you spread the word about your latest business venture. Who are the people you’re surrounding yourself with in your professional life? Make sure those people are lifting you up and encouraging you to move forward. Your tribe is your lifeline and will give you support while you make strides to reach your goals.